Pretty simple outfit today. But sometimes the simple things make you the most happy! I'm pretty sure I've worn some variation of this outfit before, but you know what it's cold and I'm running out of creative ideas to stay warm! I had a much more fun outfit in mind for today, but it will have to wait until the mercury is above zero again. Speaking of simple things that make you happy, you know what other simple thing is making me happy? Today is my Friday! I am still a little ahead in my time off bank and my boss is getting ready to go on a rather long vacation, which means no time off for me, so she encouraged me to take a Friday or two before she goes. I will happily do so! I'm planning to finally get over to Clothes Mentor and hopefully sell some stuff in the morning, maybe do a little thrifting in the afternoon and then in the evening the Pants Monkey and myself are making our annual trek to Winterfest - a winter beer festival here in MN. It will be a fun day. Actually, it should be a fun weekend, we have nothing planned for Saturday so are hoping to catch a movie and then Sunday we'll go watch the Super Bowl with my in-laws. Fun times ahead, but have to get through work today first. As I think about shopping tomorrow, another simple thing making me happy is I'm proud to say I spent no money on myself for clothes the entire month of January. I have no idea how that happened honestly. I suppose getting the bag of goodies from my cousin helped with that. Add to that the fact that I was down for a bit with a headcold and then just hibernating from the cold outside and somehow I was on a shopping ban without even knowing it! That will change tomorrow though! I am kind of laughing at myself in this last picture - it looks like my left arm is disappearing - I had sort of tucked it behind the door, not on purpose. Oops! Oh well. What simple things are making you happy today? That is a super cute outfit today! I really like all the neutral colors. Enjoy your day off tomorrow. I like this long lean look on you, Beth. A simple thing that's making me happy today? A lovely silk scarf from a fellow blogger! i love stripes! pants, shirts, you name it! I love this sweater on you and I love that you belted it. Super cute! Sounds like you have a fun weekend planned. Enjoy your time off! Gotta love a long weekend! oh Bethie! I love this ensemble. The belted top sweater has such style and charm. Go you! Simple for me? : Oh, just playing with my doggie and hugging my HM, but not necessarily in that order. Your Friday off plans sound great. I need to hit my local Plato's Closet. I need some new heels. Savers shoes are hit and miss lately, but I am not complaining. Thanks for the fun compliment to moi. Happy Friday today, for you!!!! Love your sweater and the layering! The belt is perfect too! Yay for Fridays off! I feel it would be nice to have a Friday off sometime but sadly, teaching doesn't allow! I'd been fairly good in the no clothes shopping stakes (except for er- three hats...) but then ruined it by buying the cartoon bag and a vintage dress! Haha, sometimes I take photos where I'm not sure what happened to my limbs or face :) I didn't notice anything wrong with your last one though! 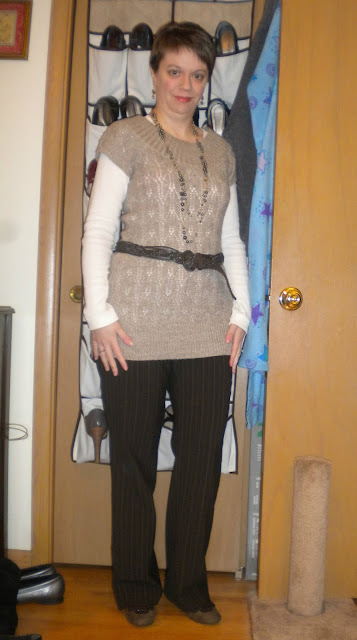 Love that you belted over the sweater...I need to do that more often, I always belt things over my tops at the waist. Simple is best, and your outfit looks anything but, Beth! The layering makes it look super chic and complex. And I love the belted tunic! Belting that sweater shows off your tiny waist and great figure. happy thrifting tomorrow! Hooray for simple and chic. Wishing you lots of luck thrifting and selling stuff. I'm simply happy to have a working computer again. Feels like I'm missing an arm without it! I'm also happy to get a little dose of sunshine even though it's cold. That is a really nice tunic on you - love the belting! I love the belted top on you - you look so long and slim. :) Enjoy your weekend! Love this look! I just bought some brown dress pants yesterday and was searching for tops to pair with them! This is perfect! This is a really gorgeous outfit. Maybe not as fun as what you initially planned, but very flattering nonetheless! The Tiny Heart Sephora Giveaway! Good for you for the no spend January. And for Fridays off! I plan on shipping some shopping items home from Vegas because it will be cheaper than checking another bag. Oops. Woot woot! Free Friday! I hope that you have an awesome long weekend, it sounds like you are going to be productive and have fun! oh, i love the brown tones in this outfit! This is a great neutral outfit. Very pretty sweater.